After the Israeli occupation Jewish settlers had decided to take over a Palestinian family’s house in Al-Khalil (Hebron), Israeli occupation forces did their best to clear it. “One of the settlers, the leader of the group, said that our house belonged to them and that we had to leave,” Abu Srour, who said more than ten soldiers and three heavily armed settlers had arrived at his home. “When I told him that this house is ours and we have the papers to prove it, he started threatening me, saying we had 10 days to leave the house and if we didn’t he would destroy it while we were still inside. “More than five soldiers beat, kicked me, and hit me with their rifles, all while the settlers egged them on,” he said. The soldiers also threw sound bombs and tear gas canisters at his mother and fired pepper spray at him at point blank range. The Abu Srour family now find themselves embroiled in a dispute they fear they will lose, despite having papers proving ownership of their house. Theirs is one of many cases of individual settlers and their organisations falsely staking claims to property – and using forged documents, state backing and intimidation to ensure they are successful. Evidence of the success of such attempts can be found just metres from the Abu Srour family’s home where Beit al-Baraka, a former church, now stands. The church compound once served as a tuberculosis hospital. Three years ago, it became part of the nearby Israeli settlement bloc, Gush Etzion. There were several steps to the compound being transferred into settler hands. Its first owners, a Presbyterian church group, fell into financial difficulties and sold it in 2010 to a Swedish company called Scandinavian Seamen Holy Land Enterprises. The firm claimed it planned to restore the church and return it to its original operations. But, unknown to the sellers, the man behind the newly founded firm was a Norwegian Christian by the name of Gro Faye-Hansen Wenske, a supporter of Israeli settlements. When Scandinavian Seamen Holy Land Enterprises announced it was going out of business in 2012, it sold the property to an American organisation controlled by pro-settler US businessman Irving Moskowitz. By 2016, the compound was officially registered as part of the Israeli settlement bloc, Gush Etzion. The Abu Srour home was built by the same missionaries that built the compound, and was home to the head of the hospital. While the Abu Srour family bought the house in 1990 – and have Palestinian, Israeli and American documents to prove it – they now fear that settlers may use backdoor methods or even forgery to claim the home, just as they “deceived” their way to Beit Baraka years ago. The settlers claiming the Abu Srour family home have not yet presented any documents supporting their case. Intimidation, falsified documents, and backdoor methods are standard practice in land deals in the occupied territory, according to reports in recent years. A 2016 investigation by Israel’s Channel 10 found that 14 out of 15 land acquisitions from Palestinians by the pro-settler Amana firm were forged. A Haaretz follow-up to the investigation detailed the processes that settler firms used to acquire land. Whenever the state sought to evacuate illegal outposts in the Ramallah area, representatives from Al-Watan – a company run by pro-settlement activist Ze’ev Hever and owned by Amana – would announce they had purchased the local lands from their Palestinian owners. In fact, Palestinians acting on behalf of Al-Watan had used forged documents, claiming to be the real landowners, and bought the properties, then transferred them to Amana, Haaretz reported. Hever is a convicted terrorist. Abdel Rahman Saleh, 71, the former mayor of the Ramallah-area village of Silwad, told MEE that companies like Al-Watan and the Holy Land Company, which he regards as fake firms run by Palestinians, Jordanians and Israelis, pay up to 60,000 Jordanian Dinars ($84,626) for each dunam of land, compared to the market rate of around 2,000 Dinars ($2,820). “These companies deny buying property for the settlers, but they have a history of purchasing land in East Jerusalem through the same means,” he said. According to Saleh, settler organisations work hand in hand with Israel’s Shin Bet to forge documents used in land purchases. Saleh has decades of experience under his belt in dealing with Israeli settlers and false land purchases. During his tenure as Silwad’s mayor, he fought a lengthy legal battle on behalf of residents whose lands were purchased using forged documents, and transferred to settlers from the illegal Amona outpost. Yesh Din, an Israeli NGO that assisted the residents of Silwad in their legal battle, said that behind Amona’s illegal construction was “an entire mechanism dedicated to expelling Palestinians from their land, with the help of local councils, the Amana organisation, the IDF, the Yesha Council, the Settlement Division, politicians and government ministries”. In 2017, Amona was evacuated, which was “a huge victory for Silwad and the surrounding villages, who also got some of their land back,” Saleh said. Representatives of Amana and Al-Watan could not be reached for comment. While the evacuation of Amona was an unusual victory, the fight is far from over. In December 2018, settlers returned to the land of their former outpost and erected two prefab homes, claiming they had just bought the land from its Palestinian owners. Haaretz reported that Israel’s Civil Administration had not examined the alleged proof of purchase before the homes were erected, and one source said the administration hadn’t even confirmed that the lot the homes were built on was the same one ostensibly purchased. Still, the Palestinians who own the land continue to be prevented from cultivating it and, in addition to fighting for access to it, also face suspicion from their community over the Israeli claim to their lands. “These cases cause so much discord within the communities, because people start to doubt their neighbours and wonder: ‘Did they really sell their land, sell our homeland, to the settlers?’” Saleh said. Just south of Gush Etzion, Abu Srour and his family fear they could be facing a similarly drawn-out battle to remain on their land. While settlers and soldiers are now using intimidation and violence to stake their claim, he worries that backdoor routes and fraud used to purchase other property could be put to use in the attempt to takeover his house. “We know that we were meticulous in our purchase of this house, and made sure to leave no loopholes for something like this to happen,” he said. 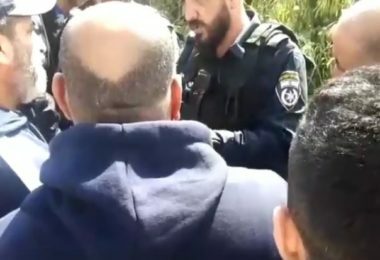 Five months before the settlers arrived with the soldiers in February, he said that the man he regards as the head of the group of settlers – who he thinks is a former intelligence officer – called him to say he wanted to buy the house. He said he would pay anything for it. Abu Srour refused the offer. “There was some fear at the time that if the settlers managed to deceive their way into buying Beit al-Baraka, they could forge some documents and try to claim our house along with it,” Abu Srour says. 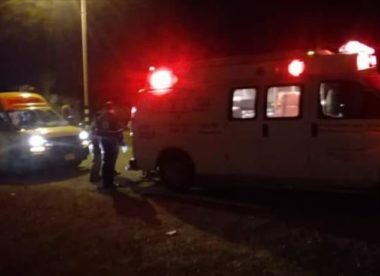 On April 4th Israeli occupation claimed that its occupation forces’ soldiers had shot two youths and arrested them along with a third on the preceding evening after they had crossed the border fence from the besieged Gaza Strip. 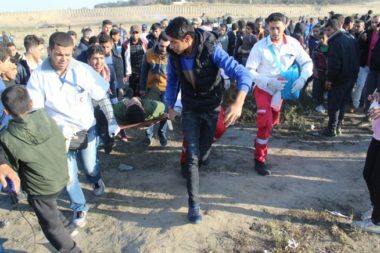 Israeli occupation also alleged that one of three youths had consecutively died of his wounds in a hospital in the city of Beersheba in ethnically cleansed Palestine 1948. Two of the youths were released back to the tiny littoral enclave on April 5th, but the identity of the youth Israel said it’s troops had killed was not revealed by either Israeli or Palestinian authorities. The two youths released were both shown to be underage. The teenager had lived week-and-a-half after his death had been announced by Israel’s regime. 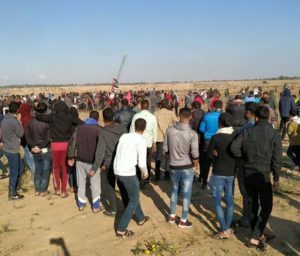 This has raised some suspicions of what actually happened to him – and a likely futile hope that some of the dozen people whose bodies Israel claims to be hoarding after killing them on the Gaza border during the Great Return March, could in fact be alive as their relatives have not been given more than the Israeli regime’s word as evidence that they are dead. For the first time, Israeli authorities decided this year to deny all travel permits to Palestinian Christians from Gaza to celebrate Easter as they do each year, by processing from Bethlehem to Jerusalem to follow the path of Jesus in the Resurrection. The number of permits issued by the occupying Israeli military authorities have diminished each year, and have included blanket bans on anyone under age 55 – but this is the first year that the Israeli military decided to allow zero Palestinian Christians from Gaza to travel to Jerusalem for Easter. There are around 1,100 Palestinian Christians in Gaza, many of whom are descended from the earliest Christians in Palestine (where Christianity originated). While some practice the Latin faith and mark Easter on the 21st of April this year, many others are Eastern Orthodox, and celebrate Easter on the 28th. 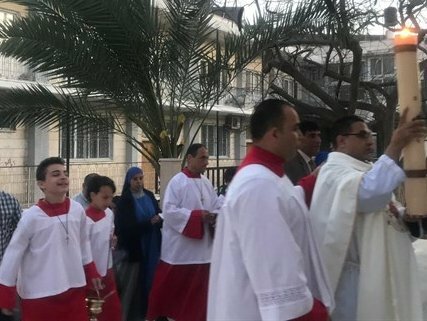 Their traditional ceremonies involve a commemoration of Palm Sunday in Bethlehem, then a procession from the Church of the Nativity in Bethlehem to the Church of the Holy Sepulchre in Jerusalem, where Christians believe Jesus was resurrected after death. “This is the first time that we know of that Israel is outright denying access of Gaza Christians to the West Bank and Israel (on Christmas or Easter). It is also a far smaller quota than previous holidays, when COGAT set quotas of at least 500 permits, or more. Such a sweeping restriction cannot be justified by security needs. “Israel’s decision to outright deny movement between Gaza and the West Bank this Easter constitutes a further violation of Palestinians’ fundamental rights to freedom of movement, religious freedom, and family life. The increased restriction on the movement of Palestinian Christians points to further implementation of Israel’s ‘separation policy’: a policy restricting movement between Gaza and the West Bank which deepens the split between the two parts of the occupied Palestinian territory. The Israeli rights group Gisha reported complaints against the Israeli authorities regarding the restrictions imposed on Christians who want to travel during the Jewish holiday of Passover, also known as Pesach, which coincides with Easter. The Russian nightclub bouncer, Avigdor Lieberman, who wanted to cut the heads of the Palestinian with his axe, is likely becoming the new Israeli defence minister. Israeli MK David Bitan told Israeli radio 103 FM on Sunday morning that Lieberman is to hold the defence portfolio again. Lieberman resigned form this ministry during the last government because he said he did not have enough power to enable him to assassinate Palestinian leaders and attack civilians. Note:Among those wounded, 543 are in serious condition and 137 had their lower or upper limbs amputated; 123 lower-limb amputations, 14 upper-limb amputations, and 25 children had their limbs amputated according to the Ministry of Health. 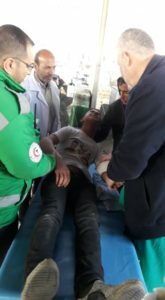 The number of those wounded only include those wounded with live bullets and directly hit with tear gas canisters, as there have been thousand others who suffered tear gas inhalation and sustained bruises. 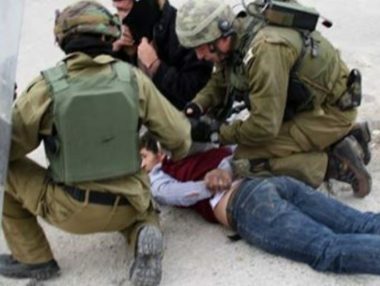 Israeli soldiers abducted, Saturday, a young Palestinian man after stopping him at a military roadblock, south of the southern West Bank city of Hebron, and took him to an unknown destination. Eyewitnesses said the soldiers installed a military roadblock at “Zeev” junction, and abducted Mohammad Ibrahim Jabarin, 19. They added that the soldiers stopped and searched dozens of cars and interrogated many Palestinians while inspecting their ID cards. In related news, the soldiers invaded several neighborhoods in Hebron city, and closed the main entrances of Sa’ir and Halhoul towns, north of Hebron, before stopping and searching dozens of cars, and examined the ID cards of the passengers.